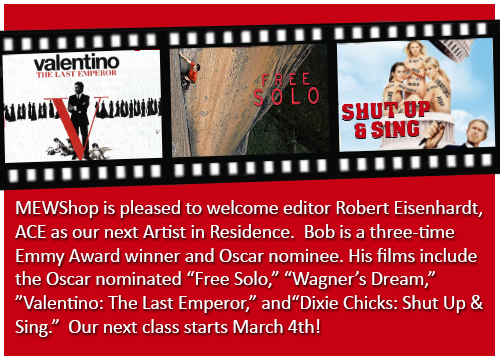 Bob Eisenhardt is a three-time Emmy Award winner and Oscar nominee. With over 60 films to his credit, he has edited documentaries for Barbara Kopple, Maysles Films, Susan Froemke, Matt Tyrnauer, Marc Levin, David Grubin and Alex Gibney. Recent films include the Oscar nominated Free Solo, Outside the Bubble: On the Road with Alexandra Pelosi, Wagner’s Dream, which received an Emmy nomination for editing, Valentino: The Last Emperor, Dixie Chicks: Shut Up & Sing, Living Emergency: Stories of Doctors Without Borders, Dancing in Jaffa. and the HBO film Everything Is Copy on the life of Nora Ephron. Newer PostOscar-nominated Editor Christopher Tellefsen, ACE Joins Our Next Six Week Intensive Workshop! Older PostAcclaimed Editor Anne McCabe, joins Our Next Six Week Intensive Starting January 7th!